Long Live the File-System ! If you have spent much time building mobile apps -- or even using them -- you will know how painful it is to work around the lack of consistency regarding the treatment of file-systems across the various platforms. iOS is the worst. Last time I looked in any detail, the iOS file-system was heavily locked-down such that one is basically confined to the very limited sub-file-system associated with a given app: making it almost impossible to flexibly share files across apps, one of the best things about the file-system in the first place ! Android and Windows Phone 8 are better, but neither is as simple and effective as the good old desktop (or laptop). Perhaps that's one of the reasons why almost half of (the many thousands of) iNavCalc users, are still routinely using the "old-fashioned" desktop (laptop) web-browser version of the app (as opposed to the mobile versions). With the desktop (or laptop) browser, it is trivially simple, for example, to import and export GPX route files (via the Import/export button on the web-form), which happens to be one of the most commonly used features of the software. I must admit I was a little surprised by all this. I had sort of assumed that the mobile versions of iNavCalc would rapidly outweigh the desktop version in terms of usage volume. But a year or so after releasing the mobile versions, the desktop still commands 50% (or so) of the daily action. These functions are all available via the Import/Export popup, as illustrated in the screenshot below. Of course with the mobile versions of iNavCalc, there is a workaround: namely exchanging files via email and via the Cloud storage functionality....but sometimes you can't beat the good old file-system in terms of simplicity and convenience. Alas, my beloved quadcopter - complete with GoPro Hero 2 - featured in my recent post, has been lost at sea. It was unable to fight against the strong winds that carried it out to sea from the launch site in the Ramsey playing fields (Isle of Man). Despite my best efforts to steer it to safety, the Irish Sea has claimed it. I did some instrument flying refresher training the other day with an instructor plus a bunch of (heavy) documentation on-board. Got me thinking about weight & balance. Normally I fly solo so am well within the loading limits of my Scottish Aviation Bulldog, and hence I don't need to check routinely. 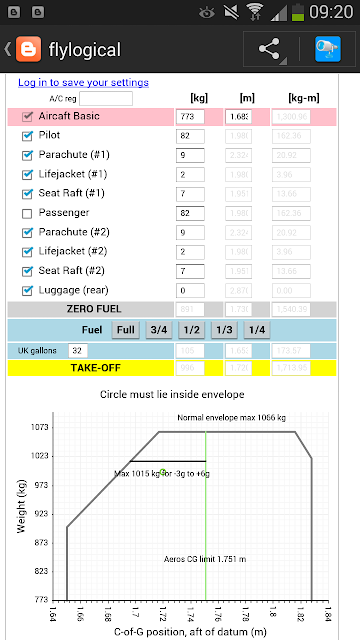 Anyway, when I was calculating the loading and checking against the charts and graphs in the Pilots Operating Manual, it struck me that this would be a very good example of a calculation well-suited to a web-app. So I put one together (see screenshot below) and have published it for general use. You can find it here. It is free to use. If you register with FlyLogical (also free), you can save (and retrieve) your settings across sessions.